﻿ Luke 23:43 And He said to him, "Truly I say to you, today you shall be with Me in Paradise." And He said to him, "I assure you: Today you will be with Me in paradise." Jesus told him, "I tell you with certainty, today you will be with me in Paradise." 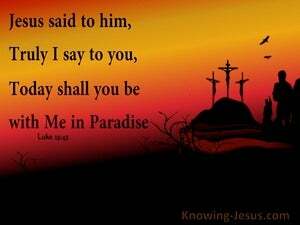 And Jesus said to him, Truly I say to thee, today thou will be with me in the paradise. 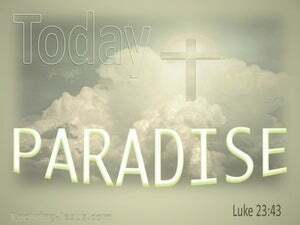 Then Jesus said to him, "Truly I tell you, today you will be with me in Paradise [Note: This is a place in God's presence, referred to as "the third heaven" (II Cor. 12:2-4), and where overcomers will be able to eat from "the tree of life" (Rev. 2:7)]." And Jesus said to him: Verily I say to you, to-day you shall be with me in paradise. Jesus answer'd, verily I tell you, this day thou shalt be with me in paradise. And Jesus said to him, Truly I say unto thee, This day shalt thou be with me in Paradise. And he said to him, "I tell you, you will be in Paradise with me today!" And Jesus said to him, Verily I say unto thee, To-day shalt thou be with me in paradise. And Jesus said to him, Truly I say to you, This day shalt thou be with me in paradise. 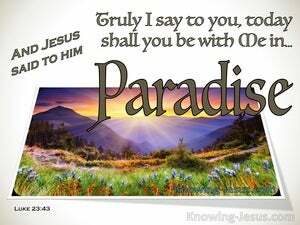 And Jesus said unto him, Verily I say unto you, Today shall you be with me in paradise. And he said to him, "Truly I say to you, today you will be with me in paradise." And Jesus said to him, Truly I say to you, Today you shall be with Me in Paradise. "I tell you truly," said Jesus, "you will be in paradise with me this very day." "In solemn truth I tell you," said Jesus, "that this day you shall be with me in Paradise." And Jesus said to him, "I tell you the truth, today you will be with me in paradise." And he said to him, "Assuredly I tell you, today you will be with me in Paradise." And he said to him, Truly do I say to thee, Today shalt thou be with me in Paradise. And he said to him, I tell you truly, to-day you shall be with me in paradise. 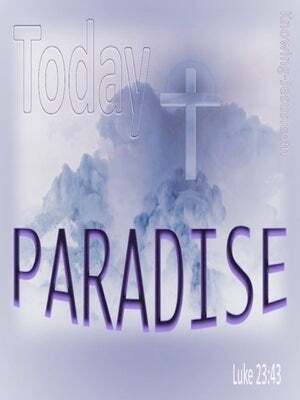 And he said unto him - Verily, I say unto thee this day: With me, shalt thou be in Paradise. And Jesus said to him. Verily I say unto thee, To-day thou shalt be with me in paradise. And Jesus answered: "I tell you, this very day you shall be with me in Paradise." And Jesus said to him, Verily I say to thee, This day shalt thou be with me in paradise. "I tell you in solemn truth," replied Jesus, "that this very day you shall be with me in Paradise." So He said to him, "I solemnly say to you, this very day you will be in paradise with me." And He said to him, "Verily I say to you, "To-day you shall be with Me in Paradise." And Jesus answered him, I assure thee, thou shalt be with me this day in paradise.